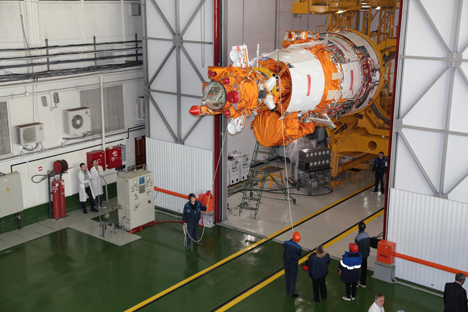 In late December 2014 the Russian Resource-P 2 satellite was launched into orbit. It contains the Nucleon instrument whose mission is to search for the mysterious and strange dark matter by registering and studying galactic cosmic rays. The Nucleon instrument was developed by the Nuclear Physics Research Institute at the Moscow State University. In order to attach it to the satellite, scientists were faced with the difficult challenge of making it relatively light at a maximum of 300 kilograms. At the same time they needed to preserve its sensitivity to high-energy particles. The scientists used the most recent microtechnology available. As a result there are 12,000 independent sensors in the Nucleon apparatus alone. It is expected that the project will increase global data concerning the registration of galactic cosmic rays collected in the last 50 years of study by at least twofold. The experiment will continue for a minimum of five years. The Nucleon scientific instrument is fixed to the Resource-P 2 with a barbell. "We created a small makeweight of a large space instrument, so to speak," said Dmitri Podorozhny, project manager and director of the Nuclear Physics Research Institute. "In times of limited financing of basic scientific programs such a solution is quite progressive, and in our case it is the only possible one. Our approach helped us avoid creating an expensive specialized space instrument for the experiment. A kilogram of payload in orbit costs two times more than a kilogram of pure gold." Cosmic rays are the most important component of the visible part of the Universe's matter. That is why studying them is one of the fundamental challenges of the natural sciences. The main parameters of cosmic rays are the types of their particles and the amount of their energy. These are the characteristics used for building galaxy and Universe models and for implementing a targeted search for phenomena that could provide experimental evidence of the parameters of the dark matter's particles. According to scientists, dark matter's share in the Universe is 26.8 percent. By understanding its origins, we could come closer to solving the mystery of the Universe. "The fact of the dark matter's existence is established by gravitational effects, but its nature is still the subject of many various theories," explains Podorozhny. "The Nucleon Project helps implement a targeted search of data by verifying the theories on the existence of strangelets, the dark matter's particles. Supposedly, strangelets came about in the early stages of the Universe's evolution and could have remained as relics. Moreover, according to contemporary models, strangelets can also come into being in the present time when neutron stars clash with quark stars." It is not by chance that the Nucleon was sent into orbit. It is possible to obtain more precise characteristics of galactic cosmic rays only above the Earth's atmosphere, since only secondary particles, and not the cosmic rays themselves, reach the surface. These secondary particles are created when cosmic rays interact with atmospheric matter.